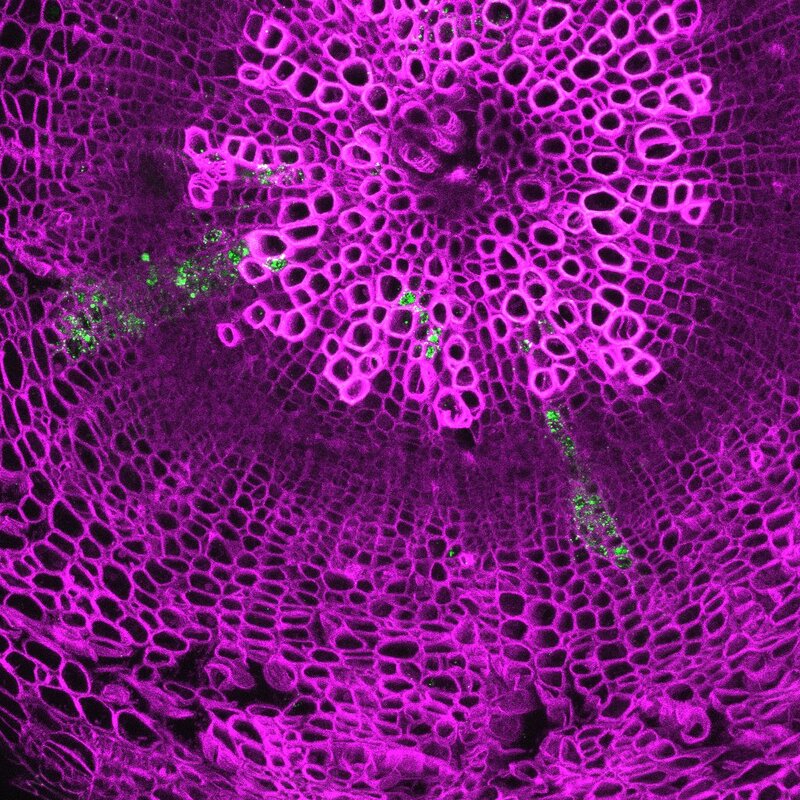 Radial growth in plants is driven by proliferating cells in the cambium that give rise to the vascular tissues of xylem and phloem, and increases plant girth. However, the identity and dynamics of the stem cells that drive this crucial process remain poorly understood. A paper in Development now characterises cambial stem cell activities in the hypocotyl of Arabidopsis. 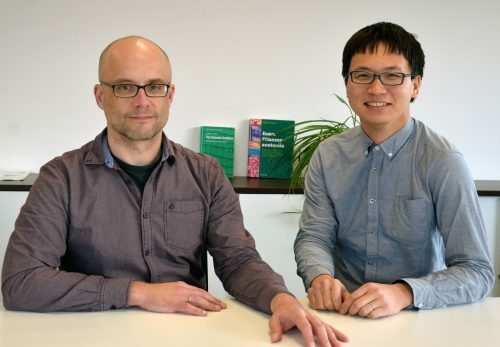 We caught up with first author Dongbo Shi and his supervisor Thomas Greb, Heisenberg Professor at the Centre for Organismal Studies in Heidelberg University, Germany, to find out more about the story. Thomas, can you give us your scientific biography and the questions your lab is trying to answer? TG I started my career as a diploma and PhD student at the Max-Planck-Institute for Plant Breeding Research in Cologne, Germany. After spending 3 years as a postdoc in the lab of Caroline Dean at the John Innes Centre in Norwich, UK, I became a Junior Group Leader at the Gregor Mendel Institute in Vienna, Austria. From there, I moved to Heidelberg University, Germany, where I became a full professor in 2016. Starting with my work as a diploma student, I was always fascinated by the question of how plant cells coordinate their activity in space and time, and how they respond to the environment. When we started working on radial plant growth, I realized that our lab had identified a process which allows us to focus exactly on those fundamental aspects of biology. Conveniently, the process is the most productive growth process on earth in terms of biomass accumulation, so it is clear that this work has quite some relevance in this regard. And Dongbo, how did you come to join the Greb lab, and what drives your research? DS I received my PhD in 2014 from Kyoto University, Japan, after working on a project in mouse oviduct development, which also ended up as an article in Development (Shi et al., 2014). The project was carried out in the National Institute for Basic Biology, Okazaki, Japan and co-supervised by Toshihiko Fujimori [National Institute for Basic Biology (NIBB), Japan] and Tadashi Uemura (Graduate School of Biostudies, Kyoto University, Japan). I was fascinated by the beauty of morphogenesis and wanted to understand the mechanisms behind it. After obtaining my degree, I was looking for a place to continue my career as a developmental biologist and to broaden my view on science by changing the topic and place. In both NIBB and Biostudies Kyoto University, you find a broad range of biological research focusing on animals and plants. Thus, I was regularly exposed to plant science and stimulated by the talks and seminars. The more I learned, the more I wanted to try it myself, and I felt that there were still many important questions to be answered. First of all, I felt that cambial stem cells should be identified more clearly. Consequently, I asked Thomas for an opportunity to apply for a fellowship to work in his research group: he not only agreed, but also rigorously helped me to strengthen the research proposal. As a result, the Alexander von Humboldt Foundation was brave enough to offer me an opportunity, and I took this chance to come to Heidelberg in 2016. In addition to the support from the Humboldt Foundation, I really appreciated that Thomas welcomed me. I think it was not an easy decision to accept a young scientist from a different field whom he had never met before. I think it is my personal interest that mainly drives my research. I know this is not always easy, but I want to follow my own interests for as long as I can. The existence and activity of cambial stem cells were first postulated 150 years ago – why has it taken the field so long to experimentally analyse them? TG Experimental analysis of the cambium has quite some history in woody species like Populus. However, identification of the underlying stem cells was always difficult due to the lack of definite cellular markers and efficient genetic tools. Only when it became clear that radial growth exists and is accessible in our favourite plant model Arabidopsis, did things moved forward more vigorously. Also, the fact that the cambium is embedded in all these differentiated and optically very dense tissues did not help to promote this kind of research. DS After coming to Heidelberg, I had the chance to read two books. The first one was The Vascular Cambium by Philip Larson (Larson, 1994), and the other one was Esau’s Plant Anatomy by Ray Evert (Evert, 2006). I was so fascinated by these two books, and really admire the authors and other plant biologists for their detailed descriptions and deep thoughts about the cambium over the years. I imagine if they lived today and had access to modern biotechnical tools, they would perform the same analyses as I do, perhaps even in a more sophisticated way. On the other hand, I think these thorough descriptions and summaries prevented researchers from reviewing cambium dynamics or challenging it afterwards. Also, to me, it looked initially like a finished story. Excitingly, our findings prove that cambial stem cell activity is, to a large extent, as proposed, which emphasizes the brilliance of these former anatomists. A cell clone originated from a single cambial stem cell contributed to both xylem and phloem. Maximum intensity projection of confocal images of hypocotyl cross sections, with cell wall visualized by Direct Red 23 staining (magenta) and cell clone visualised by Venus targeted to endoplasmic reticulum (green). TG The basis of this work was the identification of promoters which are specifically active in different cambium domains. Although some of them were described before to be active in cambium stem cells, we discovered that they are active in stem cells and the wood-forming part of the cambium, but not in the bast (phloem)-forming part. By finding that the activity of the SMXL5 promoter labels the bast-forming half of the cambium, we had the tools in hand to perform a thorough cell lineage analysis targeting the bidirectional mode of tissue production by the cambium. We found that common stem cells producing both tissue types are located in a narrow and central cambium domain in which all those promoters are active. We also saw that those cells proliferate more than the immediate tissue progenitors. Thus, the cambium does not seem to hold transient amplifying cells as seen in other plant stem cell systems. DS I think being able to analyse the history of distinct cells represented a substantial step forward in comparison to the snap shot analyses done so far. For any given division of a bifacial stem cell, what determines the fate of the daughter? DS & TG This is certainly one of the most fundamental questions in the field. We know that gene expression profiles in the two tissue-forming regions are quite different, and that these profiles and individual regulators active in those regions are instructive in this regard. Currently, we think that, when a cell gets under the influence of those regulatory environments, they adopt the respective cell fates. However, we still do not have an integrated view on how these domains are established and maintained in the first place, let alone how they communicate with each other to balance tissue production and patterning. How and why does cambial stem cell activity differ to other animal and plant systems? DS & TG As mentioned above, we found that proliferation in the cambium domain mostly takes place in the common stem cell region. It looks as if, after they have divided, one daughter cell undergoes differentiation very soon and, if at all, divides only once or twice. This is different to stem cell systems sitting at the tips of shoots and roots, and also to most animal stem cell systems. There, tissue-specific progenitors divide relatively often, forming a transiently amplifying domain. Thus, we seem to have a special situation in this regard in the cambium. We think that this is because the ratio of stem cell number versus the number of differentiated descendants is relatively high in the cambium. So one given stem cell is only responsible for the production of a rather narrow radial sector in the stem or the root. DS The most exciting moment was when I got the data shown in Fig. 3. To be honest, I did not notice what it meant immediately while I was sitting in front of the confocal microscope. I was in a rush in collecting data because time slots available for working at the confocal microscope are usually short. After I went home, and it was probably a weekend, I still wondered what I observed. Then I noticed that I could only draw one conclusion: cambium-derived cells originate from cells sharing PXY and SMXL5 promoter activities. I questioned this conclusion again and again, checked the images many times, but I could not come up with any other reasonable interpretation. I could not wait to come to Thomas’ office and show him what I found. Before I could give my interpretation he said ‘Wait, Dongbo, let me think this through for a second’. He came to the same conclusion. DS I would say this research went relatively smoothly, but since I started a new project in a new field and a new country, it took me a while until I got the first meaningful results. It was frustrating that, sometimes, things which took me several days in Japan took me several weeks in Heidelberg, due to misunderstandings, cultural or system differences, lack of experience with plants, and so on. And of course, I could not exclude the possibility that the experimental design simply would not work. I felt very relieved when I saw that the EdU incorporation and the inducible Cre-loxP system actually worked in Arabidopsishypocotyls. I really would like to thank Vadir López-Salmerón and other members in Thomas’ lab who supported me during that time. DS I think we are still at the very beginning of our research in radial plant growth. 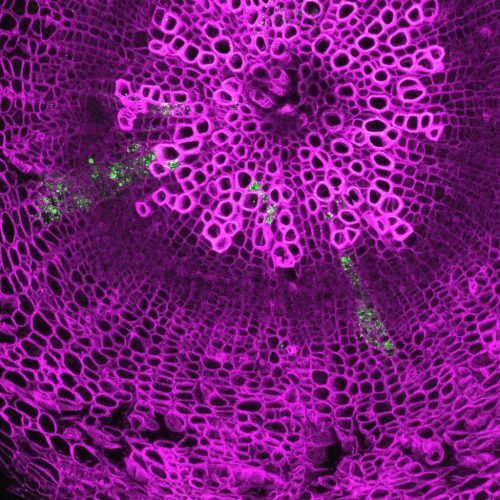 I want to describe the activity of cambium cells in a more quantitative manner and, of course, want to decipher the regulating mechanism of radial growth in terms of morphogenesis. As you asked, how the fate of daughter cells is determined after the cambial stem cell division is really an important and challenging question I want to address. Where will this work take the Greb lab? TG I think this work represents one milestone in our research because we were able to allocate various cambium functions to distinct spatial domains. Of course this opens many opportunities for characterizing these domains in more detail, and also for asking the question of how they are maintained. Finally, let’s move outside the lab – what do you like to do in your spare time in Heidelberg? DS Visiting towns and walking the streets. The culture and the society in Germany are of course very different from those in Japan. During the last two and a half years, I have visited many small towns around Heidelberg and joined many events like the city festival, the summer festival, the wine festival, and so on. Every town has its own atmosphere and the people there seem to be very proud of their towns. Fortunately, my family also likes it a lot, so we travel often together on weekends. TG As Dongbo says, the Heidelberg region provides many opportunities for enjoying life. Because Heidelberg is small, nature is close and we do a lot of hiking with the family. Also, the many cultural events happening in the region, many adapted to young children, keep us busy.